Hotel Everest was the perfect place to stop in Pushkar. Nice and quiet yet close enough to the main markets and lake, room was clean, shower was hot and hotel full of character. Certainly one of the better places I’ve stayed in India for the price. Would recommend. 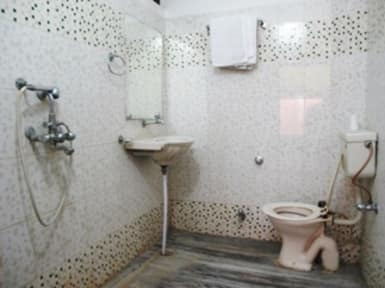 Great location, close to the ghats but on a quiet street. Friendly staff and good food at the rooftop restaurant, which has a phenomenal view. The whole place is colourful, clean and well-cared for. Nice to have soap, towels, and drinking water available. Would happily stay here again! Wonderful and clean place to stay at. Staff was very friendly and helpful and the hotel was clean. Would come back! Great spot to get away from the noise of the god awful bus horns! Place was quiet but extremely hot! Make sure you get A.C.! They were having electric problems when I was here so woke up a few times covered in sweat.. Not their problem though! The roof was ok, but they need fans badly! 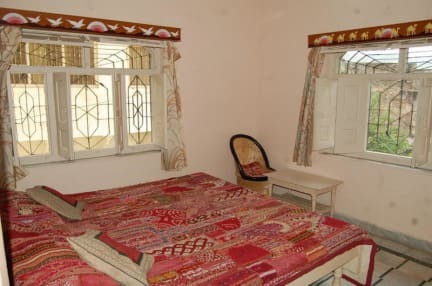 The rooms were pretty basic, just a bed and shower, not good for meeting people though..
Our booking unfortunately was missed and upon arrival the hostel was booked up. However the staff were extremely helpful and helped us find somewhere else. It looked good from what we saw and brilliant direction from the bus station.